How is the womb of the dead donor works in delivering the first baby girl in the world? When any Female Needs to go for IVF treatment? The womb of the dead donor should be transplanted to the female patient of Brazil who is facing the issues of infertility and with the same the female patient is able to deliver the world’s first baby girl which is delivered through the womb of the female who is died yet but with hers donated womb, the successful achievement is being processed in delivering the child of such aspect. The news is published in the local journal of the country Brazil named as The Lancet Medical Journal through which the readers get aware with the same circumstance that it is the possibility that whether to obtain the rented womb of the Surrogate the deceased should donate the womb which is transplanted in the needed female and with this the deceased female’s womb should be able to provide a new life to the new born and completes the family of many. So now days it becomes the possibility that the donor’s veins are connected to the receiver’s uterus in order to obtain the organ which one is donated to another, in case of the donation of the reproductive organ of the female so all the reproduction relative organs are connected in such aspect like the veins, vaginal canals, the uterus and ovaries are involved in the transplantation to be done in processing the procedure of the womb donation. The only successful case of the country Brazil after all the prior unsuccessful cases of mere about ten different countries of the world including countries like US, Czech Republic and Turkey where the female is not able to conceive successfully after transplanting the uterus of the deceased female. No live birth is delivered by the female in whom donated uterus of the deceased female is transplanted. But with the donated womb a woman in Brazil gives live birth to the baby girl and delivered successful results which is not becomes a possibility with donated uterus of some other deceased woman. The donation is being completed in September 2016 when the receiver is basically about 32 years old and was being conducted by the doctor named as Dani Ejzenberg at Brazil’s Sao Paulo University Hospital with the help of latest and advanced technique it is the possibility and with using the modern equipments it is done successfully and with an ease without the feeling of severe pain in such transplantation. The recipient is not having the uterus since birth and because of this the donor female with the age of mere about 45 years has donated her uterus to the receiver female of 32 years and which is in turn processed the successful delivery of the new born of the baby girl of the Brazil country who is delivered from the deceased donor’s womb transplanted to the needed woman. But the norm announced after such a case, that donor’s uterus and womb should belongs to the live family member of the receiver with such types of reproductive transplanted organs. 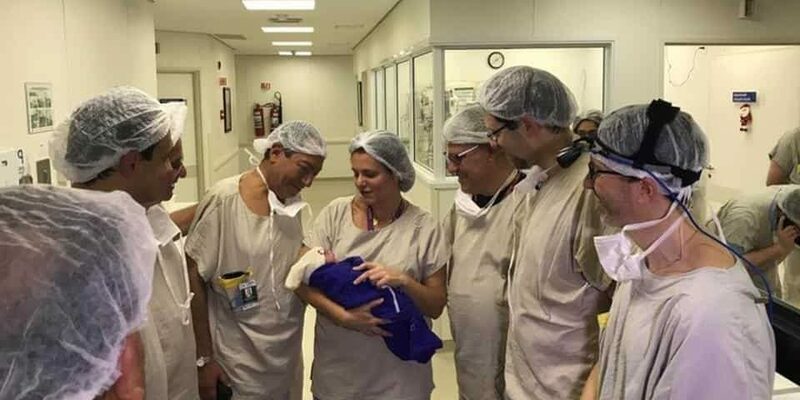 The new baby girl born in the country Brazil was delivered with Caesarian process and within 35 weeks and 20 days and having the weight of about 2550 grams at the time of birth. After breastfeeding received for merely about 7 months and 20 days to the baby girl born and she becomes 7.2 kg in total body weight within a short duration of time. After such a case it is being declared by the involved doctor’s team that the uterus transplantation is less potential in comparing with the womb transplantation which delivers the most specified results of the successful delivery. There are basically many people who wish to donate the reproductive organs after the death, but sometimes the donated organ is not delivering the positive results but only a few cases it provides the positive results. But in the country Sweden in the year 2013, a live birth is being conducted after the donor donated the womb after the death to the female in need. And also the researchers found that in total there are basically about 39 cases of such kind resulting in only about 11 live births with the same transplantation of womb after the death of the female. As only 500 in one have the problem with uterine and can’t succeeded.